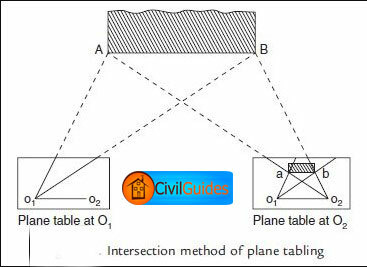 The plane table surveying is that method of surveying in which the fieldwork and plotting work is done simultaneously, and no office work is necessarily required. The plane tabling is generally adapted for surveys in which high precision is not required. It is mainly employed for small-scale or medium size mapping. The equipment needed in plane table surveying is straightforward and almost available everywhere. Following are the plane table survey instruments. It is made of well-seasoned wood. It varies in size, the common sizes are from 40 cm x 30 cm to 75 cm x 60 cm or 45 cm square, 60 cm square, etc. The board may be mounted on a tripod with a leveling head or a ball-and-socket arrangement in such a fashion that it can be leveled and revolved about a vertical axis and may be clamped in any position. NOTE: The head of the tripod may sometimes be provided with a light metal frame carrying three milled-headed screws to level the table. 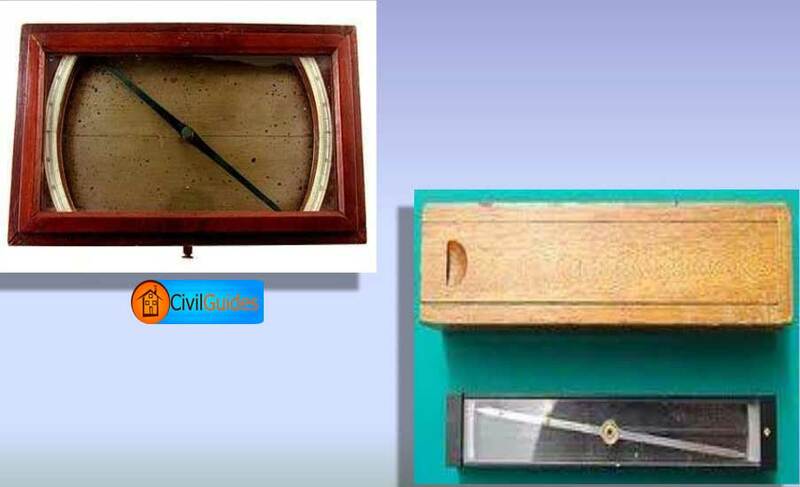 The alidade is a ruler with a sight line attached and is used on the plane table for bisecting the object, drawing rays, direction lines, etc. The alidade may be plain fitted with sight vanes at both the ends, or it may be equipped with a telescope. One of the sight vanes is provided with a narrow rectangular slit. While other is provided with a central vertical hair or wire. 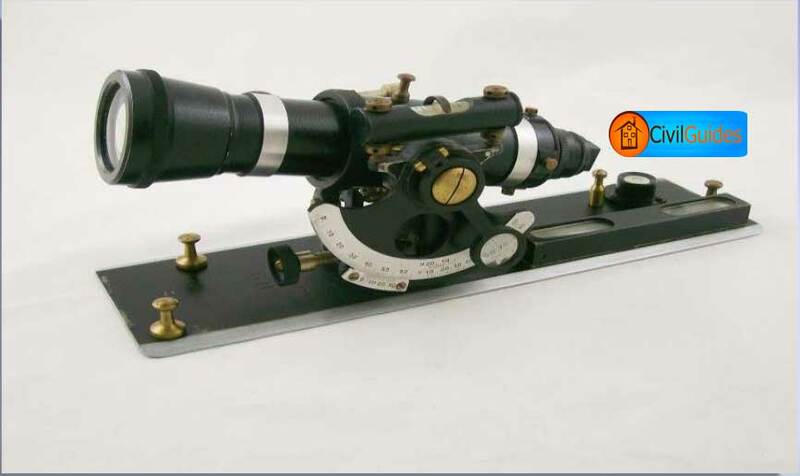 If the alidade is telescopic, the telescope is provided with a vertical circle, and a level tube is fitted with cross-hairs. If the spirit level which may be very sensitive, is not fitted to the alidade, the table can be leveled by placing the spirit level in two positions at right angles to each other and setting the plane table such that the bubble is central in both positions. Trough Compass with two bubble tubes at right angles to each other mounted on a square brass plate is used for indicating the direction of the magnetic meridian on the paper. A plumbing fork with a plumb bob attached to one end is used for centering the table at a particular station. This is used in large-scale work for setting the table such that the point on the paper (representing the instrument station being occupied) may be brought vertically over the station marked on the ground. The Waterproof cover is used to protect the sheet of paper on the plane table from the rain. The paper used for plotting the survey on the plane table should be of excellent quality because it is very sensitive and liable to changes due to the variation of humidity of the atmosphere. The paper expands and contracts in different directions with different amounts which consequently alters the scale and distorts the map. The sheet should be well seasoned for about a week by exposing it alternately to damp and dry atmosphere. This treatment reduces its tendency to distort. The sheet should never be folded. 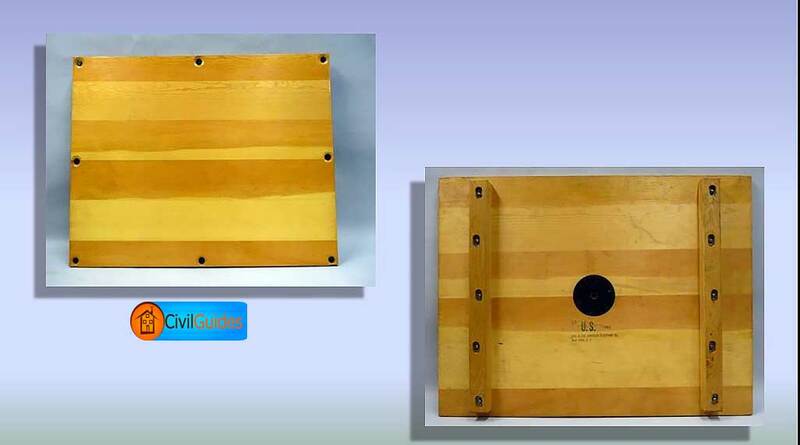 Zinc and celluloid sheet is used for plane table surveying in damp climates. The paper may be fixed on the drawing board by using drawing pins or by pasting the edges. Besides these, the other drawing instruments like a pencil, rubber, scales, etc., are also required for plane table survey. 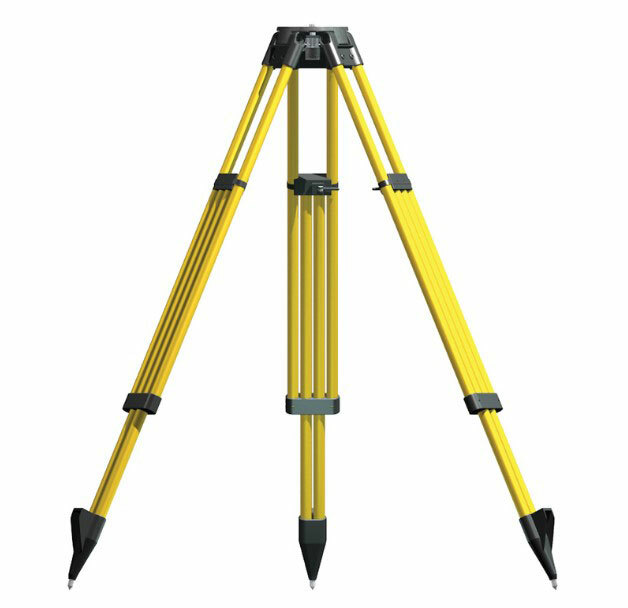 Tripod is also required for plain table survey. 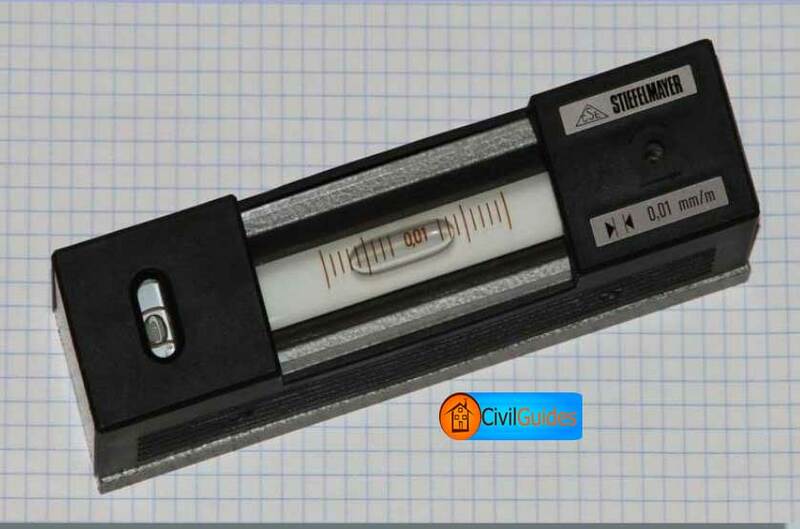 It is in one of the important plane table survey instruments without it is impossible to do plain table survey. Tripod is used to fix the drawing board. It consists of a screw at the bottom which is used to set and level the drawing board on it comfortably. 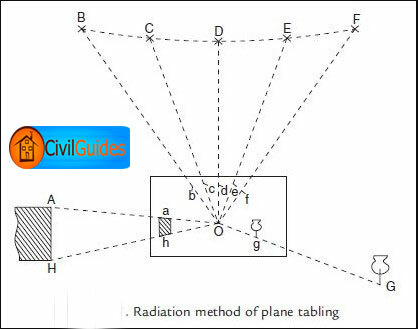 Following are some of the significant advantages and disadvantages of plane table surveying. (1) Map of the area is plotted in the field, i.e., both the field work and the plotting are done simultaneously. (2) Field notes of the measurements are not required, and thus the errors in booking are eliminated. (3) The correctness of plotted work can be checked by check observations in the field. (4) Office work is only finishing up of the drawing. (5) Direct measurements of lines and angles are avoided as they are obtained graphically. (6) Errors due to extended angular observations with angular instruments and incorrect plotting with bad protractors are avoided. (7) This is suitable in a magnetic area where you can’t rely on the compass survey. (8) More work will be done in less time and labor. (9) It is less costly than a theodolite survey. (10) It is most suitable for preparing small-scale maps. (11) Contours and irregular objects may be represented accurately. (12) The reduced levels of points other than the station points of known elevations may be found out with the help of a tangent clinometer. (13) The survey can be completed very rapidly. (14) Much skill is not required to prepare a map. (15) The danger of omitting the necessary measurement is eliminated as the survey is plotted in the field. (1) Plane tabling is not suitable for work in wet climates, in places where high winds predominate, and in wooded country. (2) If the area to be surveyed is large, frequent changes in the size of drawing sheets are required. (3) Due to changes in temperature, the table is liable to warp. (4) If the sun is bright, plotting may be difficult due to the strain on the eyes. (5) It is not very accurate for large-scale surveys as compared to compass and theodolite surveys. (5) The instruments and its accessories are heavy and cumber-some, and they are likely to be lost. (7) Since the field notes are not maintained, it is inconvenient to calculate the quantities or re-plot the survey to a different scale if required. (8) Although the plane table is advantageous in open country, it is inferior to the compass in the thickly wooded lands. (9) The plane tabling is not intended for accurate work. (1) To distinguish clearly, small letters like p, q, r, etc. should be used on the paper to represent the corresponding points P, Q, R, etc. on the ground. (2) While taking the sights, the table should be clamped in position, and the alidade must be centered on the plotted station point on the paper or drawing sheet. (3) The table must only be turned for orientation, and when it is correctly oriented, it should be again clamped in position. Watch the Video Below to learn more about Plane Table Survey. (3) Centering the table, i.e., (the point on the paper representing the station being occupied should be vertically above the point on the ground). The plane table should be set up at a convenient height (nearly a meter) by spreading the legs to keep the table approximately leveled above the particular station. The leveling is then completed by using of leveling screws (if provided) or by tilting the board by hand if the instrument has a ball and socket arrangement. A level tube or circular level is placed on the table first parallel to two screws and then over the third screw. If the leveling or the ball-and-socket arrangement is not provided, the leveling may be completed by simply adjusting the legs. Orientation may be defined as the operation keeping the table at each of the successive stations parallel to the position occupied by the table at the first station. Thus, all the lines on the paper will be parallel to the corresponding lines on the ground if the table is oriented. This operation becomes necessary in case of more than one instrument stations. and the relative plotted positions of various points in the area will be quite different from the actual ones. Centering is an essential step in plain table survey. The centering means to set the table vertically on the ground point. To perform this operation, place the pointed end of the upper leg of the fork coinciding with the point on the paper and suspend a plumb-bob from the lower leg and shift the table body until the plumb-bob of the fork hangs precisely over the center of the station peg. There are mainly four methods of plane table surveying, radiation, intersection or triangulation, traversing, and resection. and plotting to scale along the ray the distance measured from the station to the point is sighted. The radiation method is suitable for surveys of small areas which are likely to be commanded from a single station. It is useful in large-scale works if used in combination with other methods. If the distances are obtained tacheometrically with the help of telescopic alidade (provided with stadia-hairs), the work can be finished very rapidly and thus, in this case; the method will have a wider scope. This method is widely employed for plotting the details on the maps. It can also be used for plotting the position of points to be used at subsequent stations. The various points can be located by the intersection of rays drawn from two different stations (A and B) forming a baseline. The only linear measurement required is that of the baseline AB on the ground. The method may also be employed for locating the distant and inaccessible objects, the rivers, in a survey of the hilly areas (where distances cannot be measured easily), and for checking the remote objects. Traversing by the plane table is similar to compass or theodolite traversing. The method, therefore, can be used for laying down the survey lines of a closed or unclosed traverse. The details may be plotted in the usual way by taking offsets. 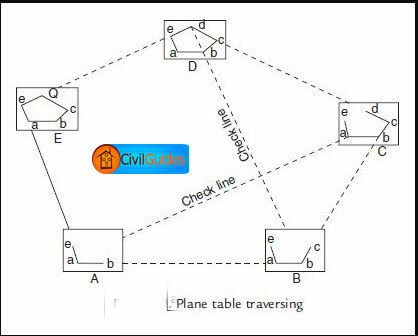 The plane table traversing is also useful for the survey of roads, rivers, etc. 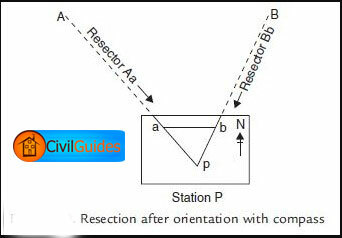 The method of resection is employed for the location of station points only. After establishing the stations, the details are located by either radiation or intersection. The main feature of this method is that the point plotted on the sheet is the station occupied by the table. Only one linear measurement is required as in the intersection method of plane tabling. Comment:I teach my class using the info. Very very useful, thank you.